That length of Whitsbury Road Fordingbridge between a point approx. 40m south of its junction with Pennys Lane and its junction with Burnham Road. From the southern point of closure, south via Whitsbury Road to its junction with Alexandra Road; east via Alexandra Road to its junction with C148 Salisbury Road; north via Salisbury Road to its junction with Waverley Road; west via Waverley Road to its junction with Pennys Lane; north via Pennys Lane to its junction with Burnham Road; west via Burnham Road to the northern point of closure and vice versa. Maps showing both the overall closure and the three phases of works. (Phase 1 | Phase 2 | Phase 3). 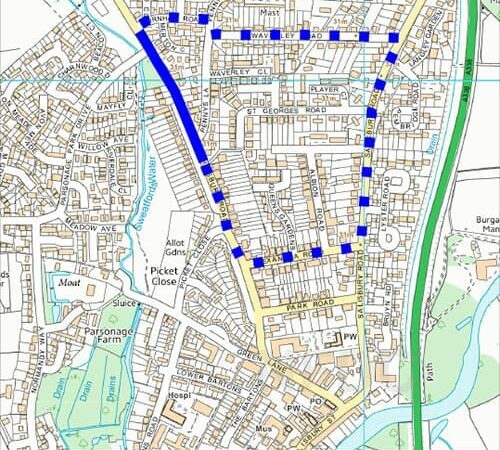 Wessex Water indicated that pedestrian access will be available at all times during the road closure, so children will be able to walk to school on these routes at all times.